The economic downturn hasn't left a lot of sunny days, possibly forcing GM to question when or whether at all it should release the Chevy Camaro Convertible. No worries, Newport Convertible Engineering is here for you. 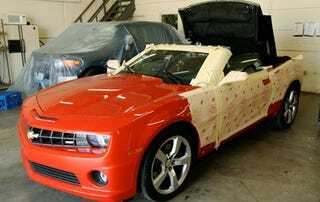 Specializing in convertible conversions, NCE will transform your hardtopped Camaro into a mullet flapping parade mobile in no time. And they'll do it now, so no pesky waiting until 2011 for your factory official soft top.